In choosing the best hair brush for you, it can be quite a debacle, can’t it? The war between these different brushes in the shaving industry has predominantly lasted for eons and getting to pick which one wins from all the others hasn’t been an easy feat for many. Two categories stand out from all the other brushes in the market today. These are the badger hair shaving brush and the synthetic shaving brush. Both categories have their own unique qualities that come with them and are very much favorites by their various bases of consumerism. In this article, we’ll look at what defines each one of them and what composes these two grooming tools, and otherwise help you make a clear decision of which brush to choose between the two. A traditional shave brush made from badger hair. With, different parts of the animal used to make the different badger shaving brushes. For example, the hair from the badger’s torso used to make the pure badger brushes while silvertip badger hair brushes made of hair from the rare parts of the badger that are scarce. That said, it’s important to note that they protect a badger in North America and Europe. With few countries that don’t worry for them. China handles badgers as pests, the reason being they grow in population and cause problems to its citizens. The country allows people to hunt badgers down and sell their hair in cooperatives set up in several villages across the country. China is the major exporter of badger hair in most shaving companies in the world. In comparison, synthetic shaving brushes have the bristles made from materials such as plastic, nylon, and urethane. The materials are reliable, their properties enable them to have a longer life span compared to the badger hair. As much as that is, they have not adopted this technology, many people still prefer the traditional badger brush or the infamous boar hair. But, it’s received many nods from men worldwide as the numbers increase. It owes their ability to resist damage and to this development. Before we dive into this category, let’s first understand the shaving brush itself. We characterize a shaving brush by three main features namely the loft, knot, and height. All the measurements done in millimeters. In definition, the loft is basically the length from the base of the tip of the brush handle up to the tallest strand, or bristle, on the brush. The knot is the amount of hair that has packed in the shaving’s tip brush in two different shapes namely the bulb and the fan. On average, most brushes have their lofts at 50mm and the knots at 20mm. Finally, we have the height practically the entire size of the entire brush. With the knowledge of the composition of the shaving brush, we’ll look at one part not described yet; the handle. The handle makes a shaving brush. In olden times, they commonly used the handle to measure the affluence of a person and to this day, the same description applies. They make handles of different materials such as wood, tortoiseshell, plastic, and many other firm elements. There is a huge amount of options to choose from. However, when choosing the handle of the shaving brush, check it fits your hand because you do not want an ugly aftershave when you’re done. A simple measurement from the base of your thumb to the tip of the handle should do the trick. Both the badger hair shaving brush and the synthetic shaving brush use the same materials for their brushes so it’s you who’s working on which handle serves you best. The quality of shaving brushes can’t really be compared to as they have their own uniqueness. With the badger hair shaving brush, you’re able to have a sensational feeling of smoothness and tranquility that comes with the smoothness of the badger hair. The downside, however, is that the quality of the hair deteriorates with time but the upside is that it isn’t difficult to decide the quality of the shaving brush. Just check the color of the hair. A good quality badger brush will have a silver color on the tip that’s easily noticeable from its creamy ooze while a low-quality one will have a much darker look and its hair will have a thick/coarse texture. In comparison, the synthetic shaving brush has better quality because of the materials it’s made with. Not only do they make the brush last longer but also give an equal sensation as a badger hair shaving brush would. The badger hair shaving brush is quite more efficient as compared to its rival. This is because of the natural ability of the badger hair to keep warmth and moisture on the brush for a long period making your grooming process rather sensational. In addition, it can lather well and keep it longer than most brushes. This makes it serve the purpose of the word “wet shave”. Synthesized shaving brushes cool faster and might not have the same smooth sensation as the badger hair shaving brush, but that doesn’t mean it’s far off. More so, it lathers much faster than other shaving brushes. This has been possible through research and enhancements done to the synthesized brush. 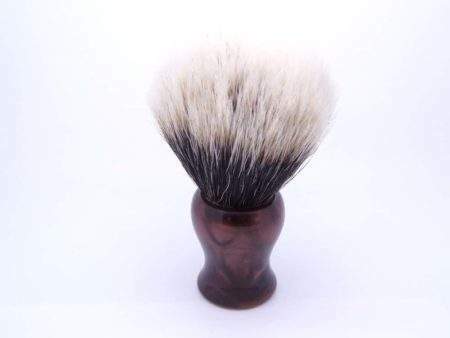 The synthesized shaving brush hasn’t been given as many names to it as much as the badger shaving brush has. The latter has several tags to it that are popular such as pure, super, fine and the silvertip just to name a few. However, this isn’t a sign that there is a standard point which all the shaving brushes should meet. The names are just made up by the shaving companies to market their different range of shaving brushes they produce. Each word, however, describes the type of brush. So buying a particular brush, e.g. the pure, would mean you’re purchasing a particular quality, which with the pure would be low. 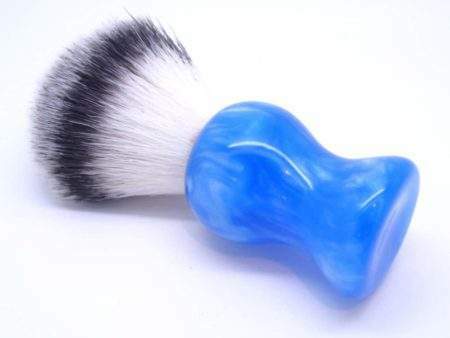 The badger hair shaving brush is much more popular than the synthesized shaving brush to many people because they’ve been longer in the market than the latter. There’s a number shaving creams, soaps, and gels to choose from and people have their own preferences for all. What many forget is that they can cause reactions on your skin if one isn’t keen on the ingredients. The reactions occur when the chemical ingredients of the cream, gel or wet soap react with natural badger hair, of the shaving brush. This is risky for an individual’s health and the cause-effect could even cause permanent damage to the hair follicles. Therefore, always remember to read on the ingredients and research the effects on certain brushes. However, if this is a buzz kill for you, use a synthetic shaving brush instead. A synthesized shaving brush is actually cheaper than a badger shaving brush. Be as it may, the affordable pricing of the synthesized brush doesn’t mean it is of low quality. The badger hair shaving brushes differ in their pricing because they have different criteria for their production. 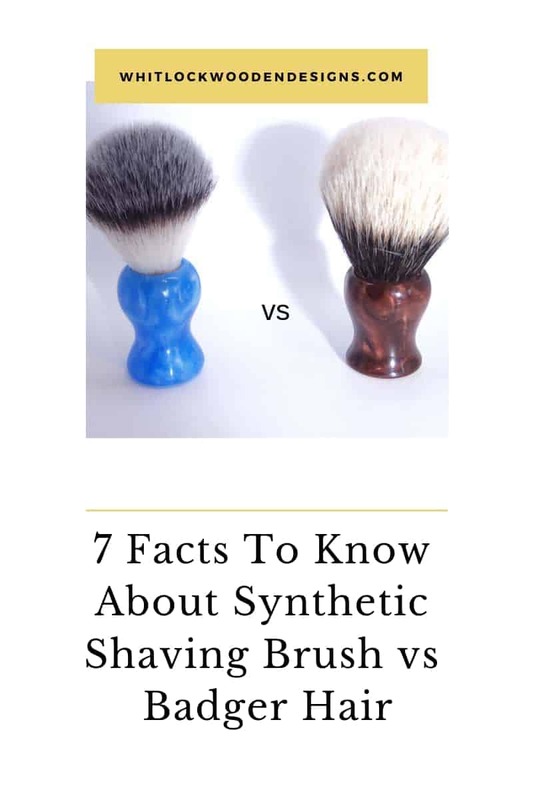 Therefore, considering buying either the badger hair shaving brush or the synthesized shaving brush should coincide with the quality of the brush you want. Conclusion Based on these facts, I’m sure we now simplify your decision for you. Choosing the ideal shaving brush is essential as it gives it the meaning of the purpose you want it to serve. With that said, we have products of the two brushes in our catalog starting with the badger hair shaving brush going for only £74.99 and the synthetic shaving brush retailing at £59.99. The brushes are all handmade with an exceptional look and feel that comes from their undistinguishable wooden handles and shapes. Have you you used the traditional brushes, any thoughts and experience? Please leave your comments below. You can find me on Facebook or any of the other social media networks, alternatively sign up to the newsletter. Only one newsletter a month and we promise not to spam you or sell on your details.